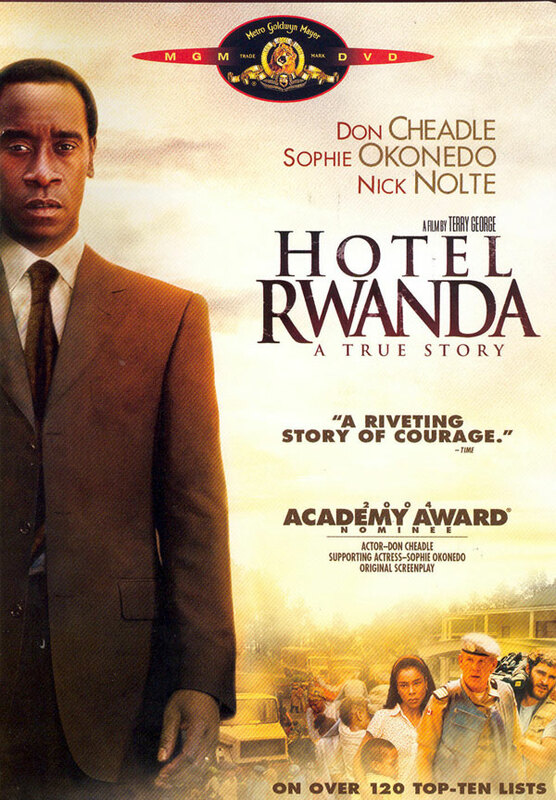 Summary: Hotel Rwanda is a powerful film, made on location in Rwanda about the true events of the Rwandan civil war from April to mid-July 1994 when Rwanda’s ruling tribe, the Hutus, slaughter almost one million Tutsis. At that time, Paul Rusesabagina is the Manager of the four-star Sabena Belgian-owned hotel, Hotel des Milles Collines, in Kigali, the capital. As the Hutus rage war against the Tutsis, Paul turns the hotel into a sanctuary for more than 1,298 Tutsis and moderate Hutus. As the hotel is foreign-owned, the people inside are protected from being killed. Paul, in turn, for the next three months, barters food and protection for his people. The film recounts the 100 days of the Rwandan war when Hutus savagely slaughtered 800,000 Tutsis, their women raped repeatedly, and their children thrown over bridges and hacked to death with farming tools. While this brutal genocide was raging on, no one from the outside world helped. But Paul Rusesabagina puts himself, his children and Tutsi wife in acute danger to help others. Not one person Paul protects in the hotel is killed. His courageous act reminds us how one person can accomplish great deeds and in doing so, he serves as a model for individual and collective responsibility in the face of horrific circumstances.